The Instant Pot might have been one of the popular holiday kitchen gifts last season, but the Dash Mini Waffle Maker has consistently been a best seller this year. The pint-size waffle maker is just a bit bigger than the palm of your hand and produce 4-inch waffles that are almost too cute to eat. It comes in a variety of colors and has a price tag right around $10 – making it a perfect impulse purchase, whether you’re shopping online or see it in the store. As a waffle fan with a Belgian-style waffle iron that I really like, I wondered how the Dash stacked up to its full size competitors and ordered one so I could give it a try. 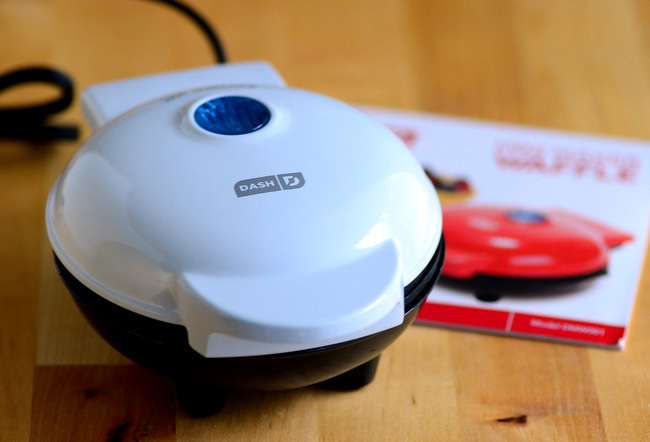 The waffle iron is so small and lightweight that it almost looks like a toy at first glance, but the waffle iron has a surprisingly heavy duty nonstick iron inside once you open it up. It has an indicator light on the top that lights up when you plug in the machine, then clicks off when the iron is hot. It does not have a on-off switch or any audible indicator, but that is true of some larger machines and not something I mind much. It does, however, mean that you need to plug it in to preheat about 2 minutes before you’re ready to use it and that you must remember to unplug the machine when you’re done. The Dash heats up quickly and the nonstick surface works very well. I found my waffles released easily from the iron both when I greased the iron and when I did not. It heated evenly and produced waffles that were uniformly brown, though the batter didn’t quite always make it to the outer edges (I chronically underfill my waffle makers, apparently) and the coloration was a touch lighter there. It took about 4 minutes to cook my waffles until they were crisp on the outside and completely cooked inside. The waffles were completely cooked at about 3 minutes, but the exterior remained soft unless they got a little extra time on the iron. I felt it was worth a little extra patience to get that perfectly crisp outside, however if you are planning to pop your waffles in the toaster to crisp them up before serving (a handy trick for small waffles), letting them be a little less cooked might be better. Since there is no audible alert, I used a kitchen timer while I cooked. All in all, the waffle iron performed extremely well and really exceeded my expectations. It produced evenly cooked waffles with a nice crispy surface and a moist interior. The 4-inch waffles were a great size for stacking, sandwiching or snacking. It does not save a lot of time over using a full sized waffle iron, however this gadget takes up almost no space in the kitchen, so everyone will be able to find room for it. 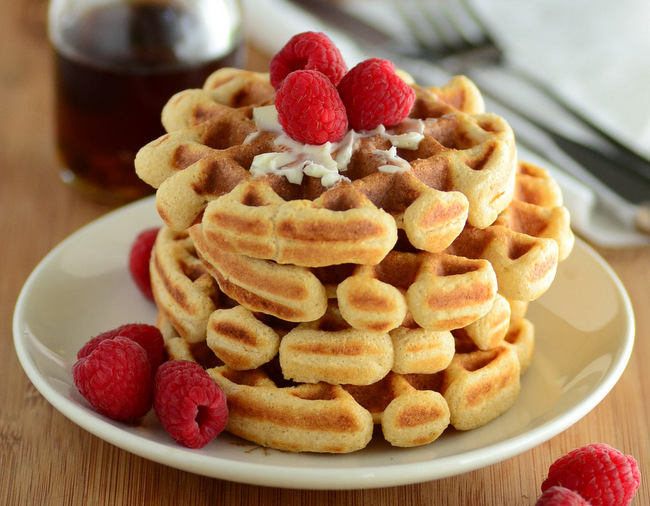 You can use any traditional waffle recipe (the instruction booklet includes both sweet and savory recipes), but I would recommend cutting them in half because a little batter will go a long way here. 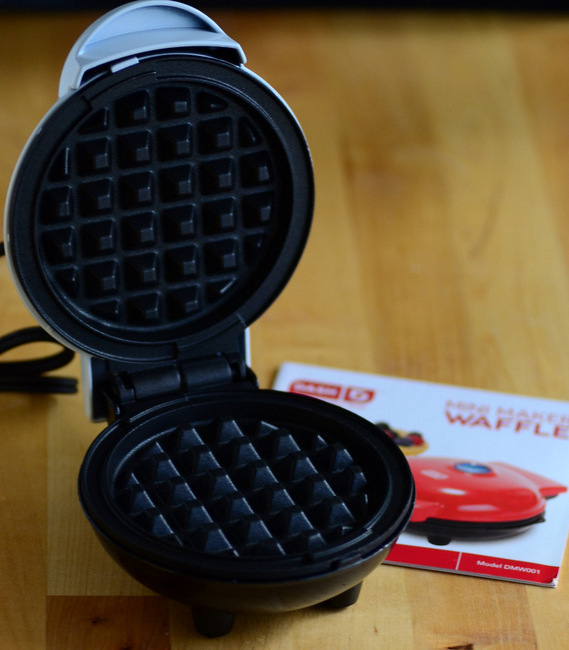 For the price, you can’t go wrong – even if you already have a full size waffle iron in your kitchen. Thank you for this! I had one of these in my hand at Home goods months ago but didn’t purchase it because I didn’t think it would work. But now I’m going back to get it!